Not long ago, few could have not imagined a world in which renewable energy would account for a large share, not even when, in 2000, Germany began incentivizing renewable energy, especially wind and solar. So, it is not surprising that the sudden and rapid development of renewable energy sources over the past decade caught many off guard, even those with a very optimistic view of potential outcomes. Today there is no doubt that Europe and the entire world are at a certain energy turning point, a sort of energy transition toward renewable energy. This was confirmed by the latest mid-term report recently released by the International Energy Agency, which emphasizes that “some countries and regions now have the potential to leapfrog to a development paradigm mainly based on increasingly affordable renewable power”. This energy transition is prompted by awareness of the scarcity of fossil fuels and scientific evidence on their impact on climate change. The European Union is no exception. Although this may seem as in the distant future, the European goal for 2050 is an ambitious reduction of CO2 emissions by 80 to 95 per cent in the entire economy in comparison to 1990, in order to maintain global warming below 20C as compared to the pre-industrial period. In doing so, the biggest cuts in CO2 emissions are expected in the electricity generation sector. The established control point on this path has is 2030, when the share of renewable energy in the EU should be a minimum of 27 per cent. In achieving this objective, pump storage plants and gas power plants will play an important role, the former because they provide electricity storage and its use when needed, and the latter because they facilitate production of back-up power, when production from renewable sources is not possible. 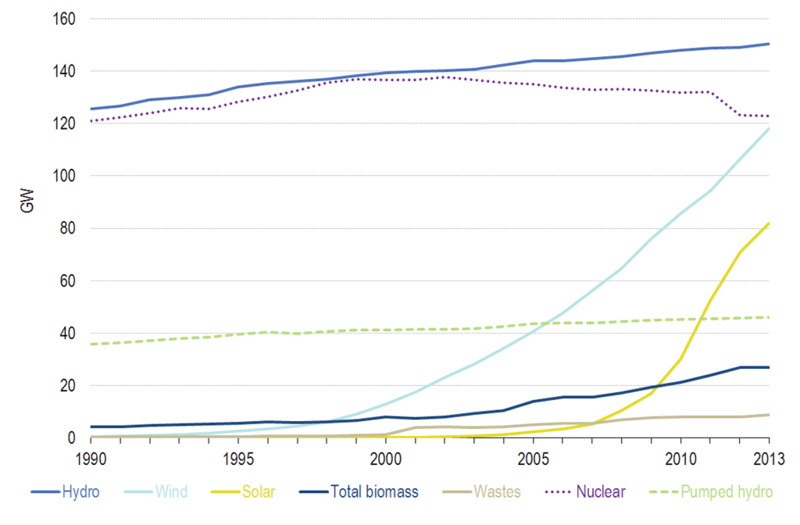 According to Eurostat data, the installed capacity of pumped storage in the period from 2000-2013 lags far behind the installed solar and wind capacity. Some authors, such as Mathias Zuber, estimated that as of early 2011, about 170 pumped-storage plants with a total capacity of almost 45 GW were operating in Europe, representing an increase of only 3 GW compared to 2008, when 42 GW were recorded. During 2014, the installed capacity of wind power in the EU-28 was nearly 128.8 GW. Unlike wind power, total base capacity of installed photovoltaic power plants in Europe (EU-28, Ukraine and Turkey) was 81.5 GW in 2013, with almost 11 GW of newly-installed capacity. Almost 75 per cent of installed energy storage capacity is distributed in eight countries in Europe, and nearly half of this capacity is installed in Germany, Italy, France and Spain. These countries have the highest number of pumped-storage plants. Estimates indicate that 60 new pumped-storage should be built across Europe by 2020. In order to facilitate the necessary flexibility of the electrical energy system, total investments should be almost €26 billion, with capacity of 27 GW. Croatia has enormous, yet underutilized, potential for electricity generation from renewable sources. The power generated by all power plants in Croatia was 4,528 MW in 2014. 412 MW of generating capacity is installed in the system for supporting electricity generation from renewable energy sources and cogeneration, of which 339 MW pertains to wind power plants 82,4 per cent of the total installed capacity. The share of electricity produced from renewable sources and cogeneration in total electricity consumption in Croatia, included in the incentive system, was 5.51 per cent. The total electricity consumption of the Croatian power system in 2014. Besides water, which has been used in Croatia for decades, wind farms account for the highest share of electricity production from renewable sources, with approximately 82 per cent. The limits of safe and reliable reception of wind-generated power have been reached in the Croatian power system due to the increasing number of unforeseen surpluses in the network not accompanied by adequate consumption. Together with significant use of solar energy, which currently accounts for only 0.2 per cent in total electricity consumption, timely investment in electrical power facilities is required for continued use of these energy sources. This will enable a safe and reliable transition to renewable energy sources in Croatia and achieve the EU objectives. Pumped-storage hydropower and gas plants will play an important role in achieving this goal. Croatia has all of the natural conditions for the construction of pumped-storage plants, while sound links to the EU power system and low-carbon oriented energy transition makes it a strategic partner in the optimum use of sun and wind, which Croatia has in abundance, but is not using nearly enough.